Fear nothing that you are about to suffer. Be aware that the devil is about to throw some of you into prison, that you may be tested [in your faith], and for ten days you will have tribulation. Be faithful to the point of death [if you must die for your faith], and I will give you the crown[consisting] of life. Towards the end of the first century, or perhaps even at the beginning of the second century A.D., the apostle John died after years of ministry to the churches of Asia Minor, the region now occupied by modern Turkey. John was the last of the original apostles, but the truths of Christianity did not die with him. His spiritual children continued to stand firm in the faith in Christ as the Son of God that John had heard, seen, and even touched (as John tells us in 1 John 1:1-2). One of John’s spiritual sons, Polycarp, was born about 69 A.D. He lived in Smyrna and learned much by listening to John. Polycarp became a leader of the church at Smyrna, and in many ways his character reflected that of his teacher. He had the same noble Christian spirit, full of gentleness, yet inflexible in speaking out against error. The Church at Smyrna, of which Polycarp was the bishop, was one of those addressed by Christ in the Revelation. Christ told them that persecution was about to come upon them and promised a crown of life to those who were faithful unto death. The promise was undoubtedly repeated by Polycarp to many in his flock to encourage them as the Romans hauled them off to face wild beasts or death by fire. 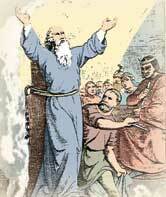 Polycarp, the last one of those personally taught by the apostles, was burned at the stake on this day, February 23, 155. As the Lord required, Polycarp was faithful unto death; he did so in expectation that he would receive a crown of life from Christ. Adapted from an earlier Christian History Story. Aland, Kurt. Saints and Sinners; men and ideas in the early church.Philadelphia: Fortress Press, 1970. Bacchus, F. J. “Polycarp.” The Catholic Encyclopedia. New York: Robert Appleton, 1914.